The lead runners at the 8K start included eventual men’s winner Phillip Hochwalt of East Wenatchee, second from left, and women’s winner Marlene Farrell of Leavenworth, fourth from left. LEAVENWORTH — Participants in the Oktoberfest Trail Runs knew rain from a big Northwest storm would be a factor in Saturday’s 10-mile and 8-kilometer races. But little did the 10-milers know they’d be running alongside a prescribed burn in the hills above Leavenworth. “It was like Jurassic Park,” said trail runner Scott Ptolemy of Wenatchee. The U.S. Forest Service lit the fire in Freund Canyon the day before, apparently unaware of the trail run event, which started and ended at Leavenworth Ski Hill. Runners reported that the first was mostly smoldering — mostly. Lead runners in the 10-mile race head out of the start area toward the first trail. “I saw flames in one spot. They were about 4 feet tall,” said Kevin Farrell of Leavenworth. The fire and rain — the wet stuff held off until after both the 8K and 10-mile runs had started — put a memorable capper on the trail run, which was the last event in the year-long Wenatchee Valley Trail Run Series. 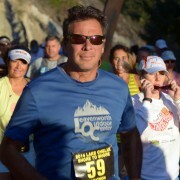 Afterwards, runners gathered in the historic Leavenworth Ski Hill Lodge to celebrate the race and the series. Cyrus Desmarais of Chelan captured the men’s 10-mile title in a time of 1 hour, 15 minutes and 51 seconds, holding off runner-up Eric Bard of Leavenworth, who was clocked in 1:16:03. Justin Hambleton of Cashmere took home the women’s 10-mile title in 1:42:43. Molly Tomlinson was second in 1:43:53. The 8K men’s race was won by East Wenatchee’s Phillip Hochwalt in 33:15. He was followed by Peshastin’s Emerson Peek in 33:34. Leavenworth’s Marlene Farrell claimed the women’s 8K in 33:44, with Richland’s Cari Mitchell second in 39:52. Mitchell traveled to Leavenworth for the race in part to celebrate her birthday. She is mainly a road runner but hopes to transition more into trail running. Despite recent rain, Hochwalt said the 8K trails were not bad. “It was soft in places, but it was OK,” he said. 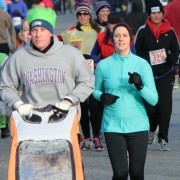 Those running the 10-mile course said it was slick in a few spots but otherwise manageable. 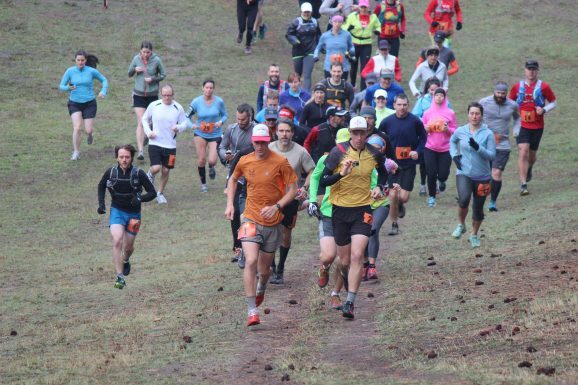 “I’ve been up there when you can’t even walk (due to mud), and I went full speed the whole way,” said Kevin Farrell, who finished fifth in the men’s race. Mike Szot, who recently moved to Wenatchee from New Jersey and finished in fourth place, said the 10-mile race was challenging. Runners gain about 2,000 feet before descending. The wisps of smoke from the prescribed burn, on the other hand, were surreal. Both he and Farrell agreed it was likely the first and last time they would ever run alongside a forest fire during an official race. “It added a real cool element, coming down in the rain and seeing this smoke coming up from below the trail,” Szot said.